Newcastle Town play in the North West Counties Premier division, a league that they have been in since 1991-2. They were only founded nine years previously. They represent the slightly lesser known Newcastle; the Under-Lyme version in Staffordshire that is contiguous to Stoke-on-Trent, and has a population of around 75,000. For many seasons they seem to have finished in the top four of the division, but promotion to the Unibond has so far eluded them. This wasn’t my first visit to the Lyme Valley Stadium. In July 1998, long before I’d started collecting non-league grounds, Brighton played them in a friendly, winning 3-0. I had also seen them in the First round of the FA Cup in November 1996, losing 2-0 to Notts County. This was played at the Victoria Ground, Stoke. It was their best ever run in the FA Cup. 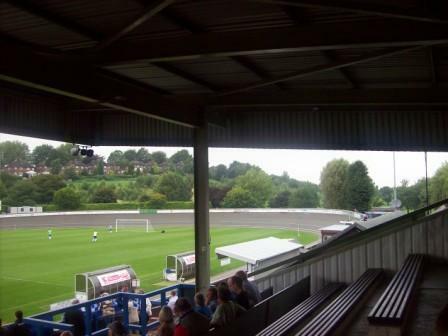 The Lyme Valley Stadium lies just off the A34 in the Stone direction. It is signposted clearly from this road. 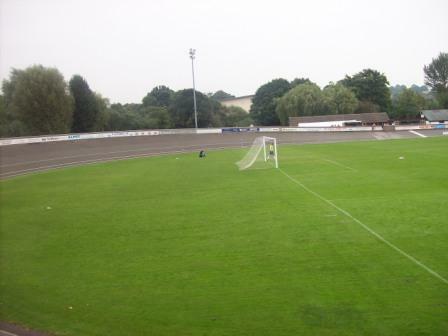 Their’s is one for collectors of unusual stadia, in that it has a velodrome round the pitch. Ordinarily, I’m not much for grounds with running tracks around them or any pitch that has large spaces between it and the stands. However, a velodrome curves very steeply at each end and, and this was news to me, it has a reasonable angle on the lengthwise sides, too. The effect of this banking is great elevated views from all parts of the ground. This seems to offset the problem of the large spaces between pitch and ground, even at the ends where the gaps are truly massive! I took my two boys to this game, Dylan, just turned 6 and Louis, 4 (his debut) hoping that some FA Cup ‘magic’ would ignite a passion for watching football. I chose this match for Louis’ debut as the cost would be low enough for me to take them out early should he be pining to go home. I did come prepared with a satchel with some other entertainment in, however, to try to eliminate that possibility. I also knew Newcastle had a high stand which would give them great views and a seat. Dylan had recently had a camera for his birthday so he was excited at the thought of taking snaps of the ground. There is a fair amount of parking at the stadium, just outside, and should the spaces fill up there is some fairly close by residential parking. A big bonus for those with kids is that there is a playground in front of the ground, just two minutes walk away. I arrived at about 2.15, which I though might be too early, running the risk of them baying to leave before the game had even kicked off! ; so they played and wore themselves out for a good half hour beforehand. Gate prices were £5.50 for adults and £3 for children but the kindly gentleman on the gate let us all in, with a programme thrown in for £10, which I thought was great value. 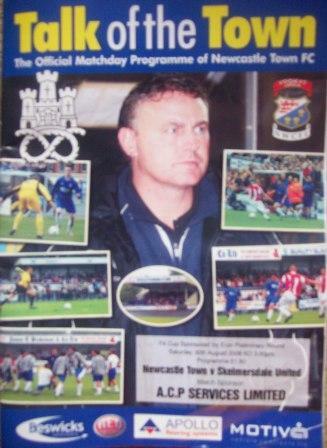 Newcastle’s opponents were Skelmersdale from the Unibond North Division, one step up from them in the pyramid. Skem, as they’re known, finished third last season and have strong ambitions of making the Unibond Premier. They are an ancient club, founded in 1882, exactly a hundred years before their hosts today. They are enjoying recent success, as it was only a couple of years back they were one of Newcastle opponents in the North West Counties League. We took our seats in the main stand, which is a steep boxy affair, with eight benches up on two sides of a middle aisle. Each bench could comfortably hold ten people, making its capacity 160, with elbow room enough to lift your coffee cup. Despite the benches having no back, they were surprisingly comfortable. To the left of this stand, above the right dugout in the picture, was a slimline stand with roof for staff and VIPs etc, it had 10 seats in it. Around the two sides was a fairly high wall and path. Walking round, the wall was so high, neither of my boys could see the pitch until we had got round the bend to the other straight side where there is a small covered three step terrace. If the football action isn’t up to much, you can watch Newcastle Rugby club, whose ground, with one moth-eaten skeletal terrace, abuts the Lyme Valley. And if you have binoculars to hand, just past the Rubgy Club is Newcastle’s Cricket Club! All three sports were in action simultaneously on this afternoon! The first half was brilliant from the point of view my boys being entertained. Dylan spent most of it taking some quite brilliant pictures and Louis, while not completely engrossed, was happy to play on the benches. The oranginas I bought them each at the kiosk were cheap, too. As for the football, Newcastle got off to a brilliant start, hitting the underside of the bar once, and making many a mazy run through the Skem defence. This only lasted for about 15 minutes, though, after which the Skem frustrated them with some good possession and got right back into it. There was a very impressive turnout from the Lancashire club – most of those sat down were Skem fans and I reckon maybe half the entire crowd were away fans. The second half wasn’t great, with Newcastle playing sluggishly throughout. Skelmersdale scored a deserved winner on 57 and held on to it. It was a shame as the promise shown in the first ten minutes just seemed to disappear somewhere, after which Newcastle looked out of sorts. It wasn’t a great debut for Louis, but he did last the 90 minutes and Dylan actually said that he’d loved it, which bears well for the future! The ground is good, with great views from all around, and has that definite unusual factor with the cycle track. Normally fans stay behind the wall enclosing the pitch, but I think for the tradition pre-season friendlies with Port Vale and Stoke City fans stand on the track, which probably makes for an excellent atmosphere. Ha ha, true protégés! Exxxcellent work! Bet Claire’s pleased that all of those “sneaky Saturdays” are finally paying dividends too! I realise this is an old post… But thought I’d comment on it nonetheless. You are right in regards standing on the cycle track – I even have some old photos myself from circa 2004 when Stoke fans were allowed to sit a mere ten yards from the touchline. Much stricter now of course, but also less likely to draw such a crowd as a result of the traditional pre-season friendly being held on the same day as another more attractive fixture – with Stoke’s ‘reserve’ team playing at Lyme Valley (or the Aspire, as it’s now known). Thanks for dropping by. I appreciate your comments. 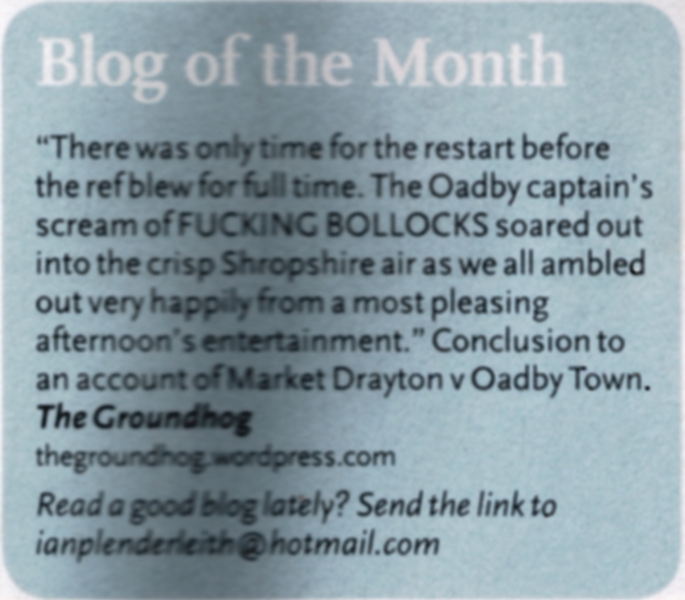 I would strongly advise following non league football – it’s very addictive. My friend was talking about setting up a blog for Staffordshire football from Stoke City down to the Staffs County League. It would be great to have a few contacts watching different local football games – maybe something to think about! 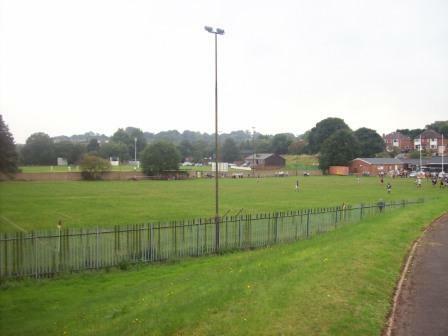 Hope to see you at a game soon – I’m at Leek CSOB’s new ground this Wednesday (11th).